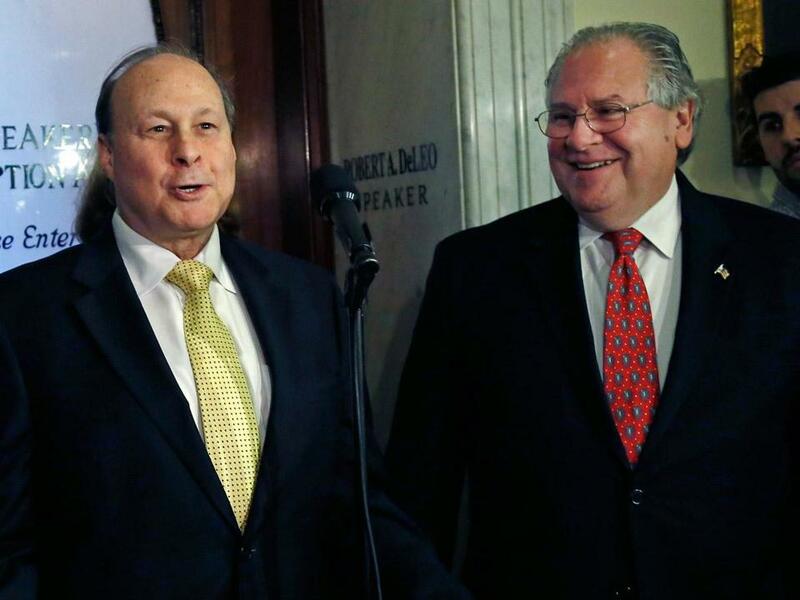 A shake-up of the Legislature’s centuries-old committee structure could bring a festering conflict between Senate President Stanley C. Rosenberg (left) and House Speaker Robert A. DeLeo to a head. The state Senate is seriously considering a unilateral shake-up of the Legislature’s centuries-old committee structure, lawmakers say, bringing a festering conflict between Senate President Stanley C. Rosenberg and House Speaker Robert A. DeLeo to a head. At issue is concern that Senate bills are not getting a fair shake under Beacon Hill’s system of joint House-Senate committees, dominated by House members, with jurisdiction over everything from education to labor to health care. With a Senate push to revamp the existing system stalled in the face of House opposition, senators are speaking more openly of the “nuclear option” — withdrawing from some or all of the joint committees and setting up independent Senate panels. Whatever the fix, lawmakers are increasingly impatient for some kind of action. While the struggle drags on, dozens of bills are in limbo. “It needs to be resolved sooner rather than later because we need to get on with things,” said Senator William Brownsberger, a Belmont Democrat. Sources with knowledge of the situation say the Senate could move as soon as next week to put the “nuclear option” or other unilateral changes in place if the two chambers cannot come to an accommodation first. Massachusetts is one of just three states nationwide, along with Connecticut and Maine, that conduct the bulk of their legislative business in joint committees. Lawmakers in both chambers say the setup has its advantages — allowing for a single public hearing on proposed legislation, for instance, rather than dueling hearings on the same subject. But the House, which is the larger chamber, has a majority of the members on the joint committees and effectively controls the flow of legislation. And in recent years, long-simmering Senate frustration with the power imbalance has come to a boil. As Rosenberg was campaigning for the Senate presidency two years ago, several colleagues complained about difficulty getting bills out of committee. And he made reform of the system an early priority when he took the chamber’s top post this year. The proposed fix: allow Senate members on joint committees to push Senate bills out of committee and onto the Senate floor. House members would have the same power to discharge legislation that emanated from their chamber. Many senators view change as a question of fairness and effective governance. “This really goes to us, as senators, being able to represent the people who elected us,” said Senator Daniel Wolf, a Harwich Democrat. But DeLeo labeled the proposal a “nonstarter” last month. And while talks between the two chambers have continued, House leaders have been reluctant to cede power. There is, lawmakers on both sides of the dispute say, no real political upside for the lower chamber in agreeing to reform. Senator Mark Montigny, a New Bedford Democrat leading talks from the upper chamber’s side, says he has a good working relationship with his House counterpart, majority leader Ronald Mariano. And he remains “cautiously optimistic,” he says, that the two sides can reach a deal in the coming days. But if the Senate winds up creating stand-alone committees, he says, the move would not be as radical as the “nuclear” moniker would suggest. Nearly every other state, he notes, has separate House and Senate committees. “At the end of the day, I don’t think it’s very aggressive stuff,” he said. The Senate has some tools, already, for forcing bottled up legislation onto the floor. Both chambers have a handful of separate committees. And senators can route bills through the Senate Ways and Means or Senate Rules committees. But the practice is generally frowned upon by House leaders, who can ignore a bill passed by the Senate in that way. And several senators told the Globe that they would prefer not to rely more heavily on the maneuver if talks with the House come up empty. Those talks have been complicated, in recent days, by Rosenberg’s attempts to stir up public support for changing the system. And he has also taken to social media with an infographic, complete with circles, arrows, and a series of water faucets, describing how the House can turn legislation on and off in joint committees. Mariano, a Democrat from Quincy, suggested in an interview with the Globe this week that it was unseemly to campaign on the issue while a six-member House-Senate conference committee was still negotiating. Two years is the length of the legislative session. Mariano also downplayed the importance of reform. Even with a change in the committee structure, he pointed out, bills would still need to pass both chambers before they could go to the governor’s desk for a signature. But senators say pushing a bill out of committee and winning passage in the upper chamber changes the political dynamic, boosting public interest and putting political pressure on the House to act. Although both chambers are dominated by Democrats, they frequently have competing agendas, with the Senate leaning more to the left than the House. And some of the strongest voices for change are liberal senators hoping to drain power from a more conservative House leadership. But senators emphasize the desire for change spreads across the political spectrum in the upper chamber, with several moderate Democrats and Republicans pressing for change. Now: Massachusetts is one of just three states nationwide that conduct the bulk of their legislative business in joint committees. The committees are dominated by House members, and Senate bills often become stalled. Proposed: Senators are considering creating their own stand-alone committees in an attempt to break the legislative logjam.